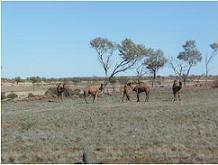 You will find many of Australia's most interesting animals detailed on this page. There are some amazing animals in Australia, many are only found in Australia. I hope the facts listed on this page help you to better understand our Aussie animals. You will also find many different photos of these animals in a range of settings. The Red Kangaroo is the largest living Marsupial. Like all marsupials, the baby Kangaroo, called a joey, is born after a short gestation period (approx 30-33 days). Immediately after birth, the joey crawls up the mother’s belly, into the pouch. 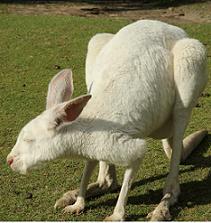 The joey is born undeveloped; it has no eyes, ears, legs, tail or fur. It is the size of a small fingernail. Once inside the pouch, the joey attaches itself to a teat where it will remain, suckling milk for the next several months. 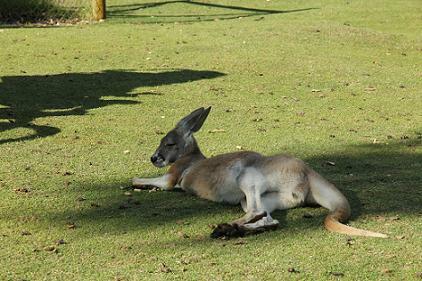 The joey will leave the pouch around 7.5 months and is independent at about 12 months of age. The female Red Kangaroo has the ability to care for three joeys, all of different stages of development. The mother is pregnant with the youngest joey; an embryo. The middle joey will be living inside the pouch. The oldest joey will be living outside the pouch, but still suckling milk from the mother. The middle joey and oldest joey drink different strength milk, from individual teats. The Wombat is the largest living, burrowing Marsupial. 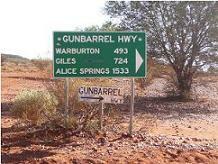 They dig large burrow complexes, which usually house several wombats. Once inside the pouch, the joey attaches itself to a teat where it will remain, suckling milk for the next several months. Wombats are muscular and powerful animals. They commonly weigh between 25 and 35 kilos. They have the ability to run short sprints at speeds of up to 40km per hour, in order to get away from danger. The Dingo is the main predator of the Wombat. The Wombat is herbivorous, feeding on native grasses. The Wombat is a member of the Marsupial family and had a backwards facing pouch (opposite to the Kangaroo). The Dingo is a primitive dog which evolved from the Indian Wolf, about 6000 years ago and became widespread throughout southern Asia. 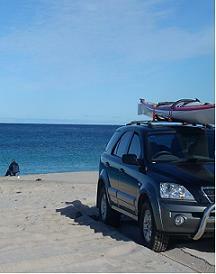 It is believed that Asian seafarers introduced it into Australia about 3500-4000 years ago. There are differences between Dingoes and domestic dogs. Dingoes only have one breeding season per year, whereas domestic dogs have two. Dingoes tend to howl more than bark as a way of communication. Dingoes lack the distinctive ‘dog-smell’ of domestic dogs. The Dingo is an opportunist hunter. Mammals make up the majority of their diet, along with a small amount of reptiles, birds, insects and even a small amount of plants and fruit. When hunting a small animal, the Dingo will hunt alone; when hunting a large animal, Dingoes will form a pack. This magnificent bird of prey can have a wing span of approx 2.5m, making it Australia’s largest bird of prey. The Wedge Tailed Eagle hunts rabbits, wallabies, small kangaroos, ground dwelling swamp birds and reptiles, however this is thought to make up a fairly small portion of their diet. They hunt by high soaring flight, circling on thermal air currents for hundreds of metres. Upon sighting prey, it swoops down, however is often unsuccessful. They feed largely on carrion. They sometimes congregate in groups of 20’s and 30’s over carrion, however rarely do more than 2 feed on a carcass at a time; the others stand or perch nearby, waiting their turn or digesting. The Wedge Tailed Eagle is commonly found throughout Australia and Tasmania, over forest and open country, on plains and mountains. Echidnas are covered in spines, which act as protection. When threatened, the Echidna will curl into a ball or dig into soft soil to protect its vulnerable underbelly. The Echidna is a Monotreme; an egg laying mammal. About 2 weeks after mating, the female lays a single soft-shelled egg, directly into the pouch on her belly. The egg hatches after about 10 days. Whilst in the pouch, the young suckles milk that is secreted from numerous pores of the paired mammary glands. The young, which is called a puggle, is first seen when it is about a year of age; it is covered in short spines and weighs less than 2kilos (adults can weigh up to 5-7kilos). Short Beaked Echidnas are found throughout Australia, and have no particular habitat requirements; they are found in regions of winter snow to dry arid deserts. They feed mainly on ants and termites. After digging into a nest with their forepaws, they extend their long sticky tongue into the chambers of the nest; the insects are drawn to the sticky saliva. The Echidna is toothless. The Spotted Tailed Quoll (also commonly called the Tiger Quoll) is the largest carnivorous marsupial on the mainland of Australia. It is an opportunist hunter of a variety of prey, including birds and their young, rats and other small terrestrial and arboreal mammals, gliding possums, small macropods, reptiles and arthropods. It also scavenges carcasses of domestic stock. It is largely nocturnal, however will bask in the sun during the day. Sexual maturity is reached at approx 12 months. The gestation period is approx 3 weeks. The female’s pouch develops during the breeding season and opens towards the tail. The joeys (4 or 5 per litter) spend about 7 weeks inside the pouch and become independent at approx 18 weeks of age. The average lifespan is 4-6 years. 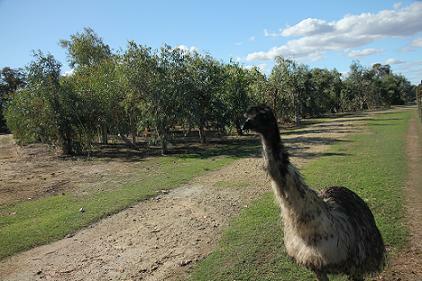 The Emu belongs to the Ratite family; it is a large flightless bird. The Emu has the ability to run at speeds of approx 48km per hour. The Emu is found throughout Australia, excluding Tasmania. Being omnivorous, the Emu feeds on a combination of insects, fruits, leaves, grasses and flowers. The female will spend about 3 weeks laying a clutch of eggs. She then leaves the clutch to join a group of migrating Emus. The male incubates the eggs for approx 2 months. During this time he rarely moves to eat or drink. After he has hatched the eggs, he raises the chicks.